We bet you don’t even want to think about Christmas yet. It’s still a bit too warm outside (when it’s not pouring outside), and we’ve still got a few weeks before every shop starts blasting Mariah Carey. There’s at least one good reason to think about December, though – you’ll need to book a place to eat your Christmas dinner! We’re unveiling our new Christmas menu and preparing for another year of making memorable holiday dishes, from 15th November. This year we’ll have a dinner menu served during our regular opening hours. We’ve been at the forefront of Pan-Asian food in Camden for over thirty years, so trust us when we say we know how to make a mean meal. 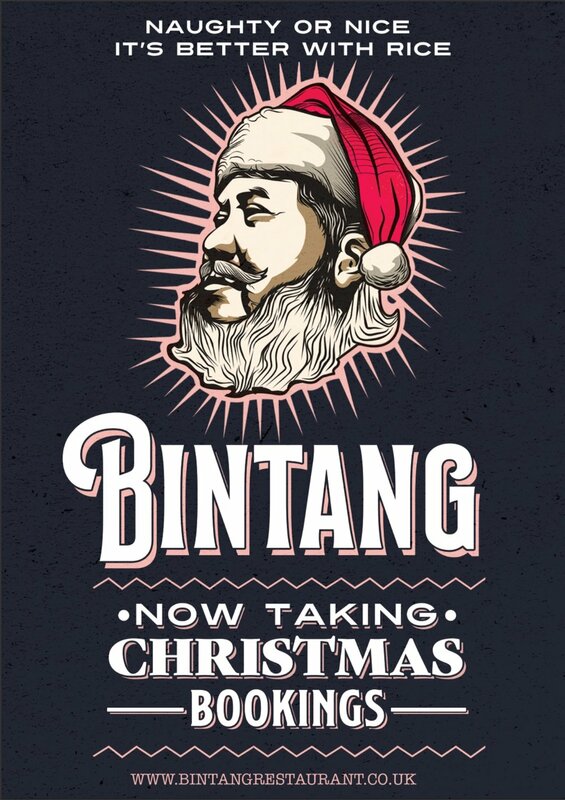 For a Christmas dinner that’s a little different, Bintang’s the place to be. Get yourself a wasabi prawn sushi tostado for a tasty treat, or treat yourself to some Filipino fried quail as an end-of-year reward. And with our BYOB policy, you can bring the Christmas spirit with you for cheap! We’ve got foods to meet practically every dietary requirement. Whether you’re vegetarian, vegan, pescetarian or pedestrian, we’ve got options for you. With a 100% halal food menu, there’s no reason to leave Muslims out of Christmas either. We also have gluten free options available. Bintang is the perfect size to bring your friends and family together for a Christmas party. We have multiple rooms that can be used for parties. Our largest room can fit up to 36 people at once, so there’s no need to worry about fitting the whole family in. As a fully halal restaurant, we don’t serve any alcohol. Instead, guests are more than welcome to bring their own bottles, for a small corkage fee. That means you’ve got your choice of bottled Christmas cheer, and at a cheaper price than restaurant drinks! Click here for more information. Click here to learn everything you need to know about our Christmas bookings.